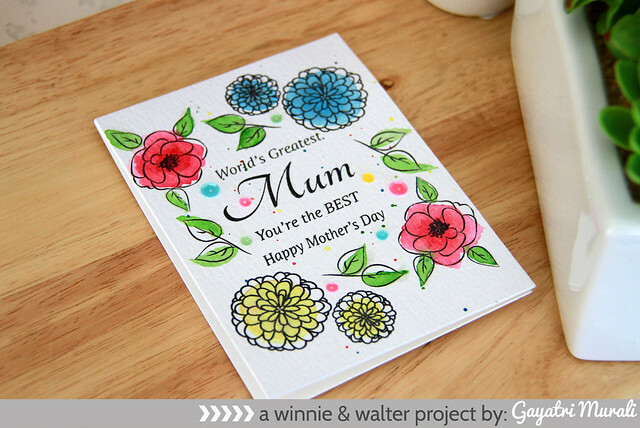 winnie & walter blog: Shades of Spring | Whimsical Watercolouring! Hello folks, Gayatri here today sharing a card using watercolouring technique which anybody can do. I call this whimsical watercolouring because it does not follow any of the watercolour rules nor colour within the lines. But it is easy to do, adds colour to your card to make an impact. Here is my card. I started with watercolour paper. I stamped the sentiment first. The sentiments are from two different stamp set which I stamped to create on big sentiment. The stamp set these sentiment come from are Parentville and Parentville Extras. To frame the sentiment I have used the flowers from The Big, the Bold and Extras and The Party stamp sets. I simply stamped them using Archival Jet Black ink because this ink is waterproof. Perfect for watercolouring. Then I chose some bright colours from ZIG Kuretake Gansai Tambi watercolour and directly coloured on the flowers and leaves randomly. As you can see, I did not colour within the lines. I also spattered the colours on the paper to bring it all together. Watercolours generally dry a bit lighter. So I added one or two layers to get vibrant colours. Once dry, I simply adhered this panel to the card front and embellished with Winnie & Walter sequin mix from Pretty Pink Posh. Love the simplicity and pop of spring colours on the card. This card is perfect to give my mother on Mother’s Day. Hope you are inspired by this whimsical watercolour technique and give it a try. 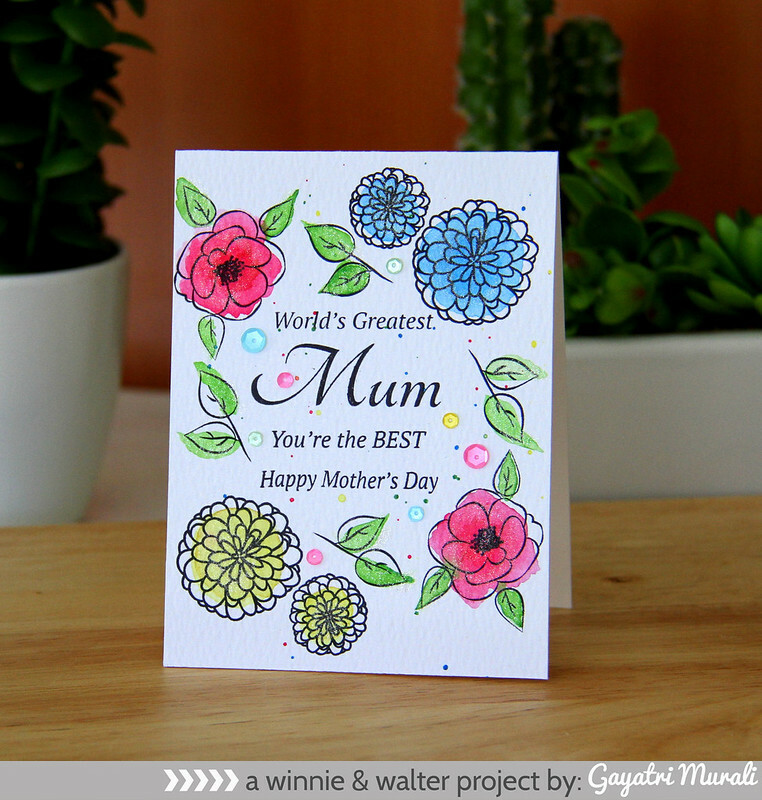 A gorgeous, spot-coloured card, Gayatri! Vibrant colours, pretty images, and a heart-warming sentiment! Your mom will adore this, as do I! 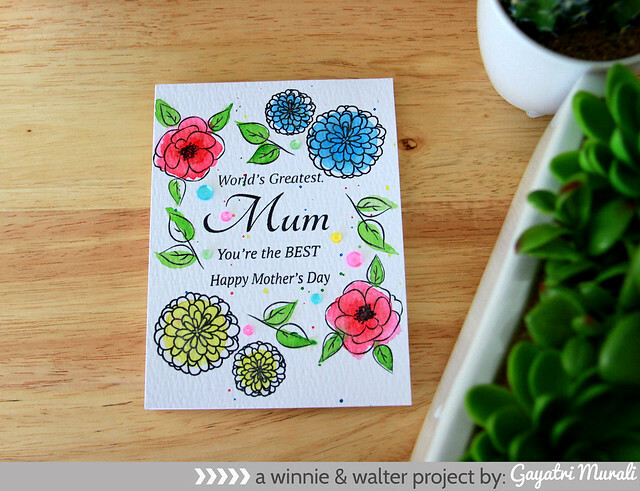 Love your idea for watercoloring, Gayatri! Will have to give this a try - it looks very freeing! Very pretty. Need to get into watercoloring. Haven't done it in a long time. It's so free and easy - rather than structured like when stamping and coloring. LOVE your sentiment stamp combo, LOVE how you have framed it with the flowers and LOVE your watercolouring too, the partial colouring & splatters look DELIGHTFUL!!! Your Mum will LOVE IT, I know I do!!! Gorgeous. Love the sentiments. Great card Gayatri. Ok I am in love with this and will definitely be giving this idea a try!!! Thank you so much for sharing and encouraging us non - watercolorists!!! !